Sometimes mothers need to learn to let their children grow up. Lifting the hide covering the entrance to her den, Kestrel leaned out slightly and gazed at the moon, just starting to become visible in the sky. Any moment now her son would awaken, for this was an important night and she knew he didn�t want to get a late start. Tiptoeing quietly over to her wooden stool, she sat down and pulled her knee-length auburn hair over her shoulder to plait it into its usual loose braid. She had scarcely gotten far when a head full of tousled blonde hair popped out from under the sleeping hides, and the rest of him soon followed. �Mother, today�s the day, isn�t it?� Tumble shouted excitedly, rousing a still-sleeping Snowdrop from her place beside him. 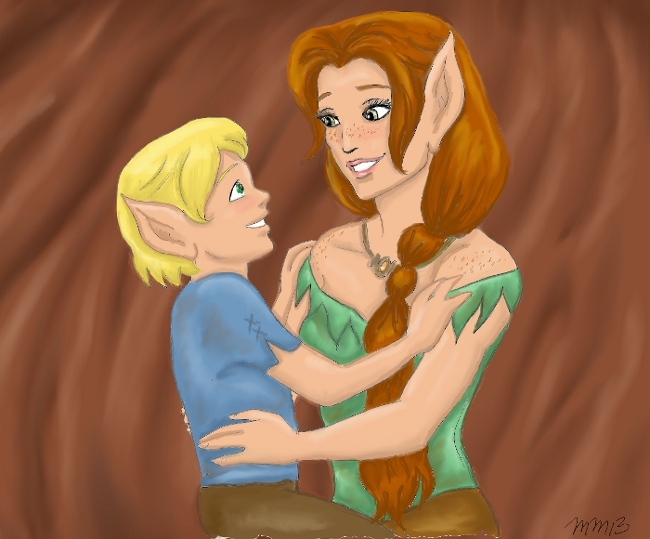 Bounding to his feet and hastily pulling on his trousers, he rushed over to his mother and jumped into her lap, causing the braid to be forgotten and the stool to nearly tip over. �Yes, my darling. Your father should be back very soon,� Kestrel responded, her son�s grin reflected on her own face. Letting out a whoop of joy, the child leapt up and rushed outside, nearly tearing the hide protecting the den. �Seems only yesterday he learned how to walk, and now look at him,� Snowdrop commented wryly, pulling on her tunic and breeches. Kestrel nodded, still finding it hard to believe that her son was now eight and two turns of the seasons old, as he had been born around the time the blackberries ripened. To commemorate the occasion, her lifemate Boar had promised to give his son his very first archery lesson with a real hunting bow, something the child had been eager to do ever since he had learned how to speak, despite Boar�s urging to learn the spear instead. The spear was Boar�s weapon of choice, but he could use a bow in a pinch, and so finally he agreed to teach his son everything he knew. �We�d better get out there,� Kestrel said, rising from her stool and taking her lovemate�s hand, and the two made haste to follow the rambunctious boy. Most in the tribe had yet to awaken, and for that the glider was thankful; it was many a time that she had had to apologize for her son�s rowdiness. Scanning the area, Kestrel and Snowdrop finally found him, staring ahead into the woods anxiously awaiting Boar�s return. �Do you see him, mother?� he called. **Lower your voice, cubling. I don�t see him yet, but I�ll bet he�s on his way right now,** she sent soothingly, trying to quell the doubt lingering at the back of her mind. She knew her lifemate to be unreliable at best, and he often disappeared for days at a time, hunting by himself or with his friend Dagger. But she was also sure of his love for his only son, and therefore tried to shove her doubts out of her head. Snowdrop, always one to understand her lovemate�s emotions just by looking at her face, placed a comforting hand on the worried mother�s shoulder. The moon rose higher in the sky, casting its pale light over everything below it. Tumble, having tired of marching around, was now dragging a foot over an area devoid of grass, drawing designs in the dirt. He would never admit it outwardly, but Kestrel could see that he was beginning to grow disappointed. Determined that his night would not be ruined, she came up behind him, caught him up in her arms and lifted him into the air, causing him to giggle in delight, as gliding with his mother was still one of his favorite pastimes. She weaved around the trees, and every time they came around to where Snowdrop stood grinning, Tumble called out to her and waved vigorously. This activity was amusing for a time, but Kestrel could only carry her boy for so long, as he was beginning to weigh her down. Setting him down gently on the ground, she looked out into the woods and the doubts from before now began to gnaw at her mind. Normally, she accepted Boar's disappearances, but her son had been looking forward to this for quite a long time. Kestrel had expected that his father, whom he idolized, would be here to keep his promise. She could try sending to her lifemate, but he was a weak sender as it was, in addition to the fact that he often shut his mind to sending in order to focus solely on hunting. �Do you think he won�t come?� Tumble asked then, his bottom lip beginning to quiver. At the sight of the disappointed boy, an emotion that was rarely felt by the normally calm and collected elf invaded her mind � anger. �Of course he�ll come, dear. While we�re waiting, why don�t we go track a rabbit for our meal later?� Snowdrop interjected hastily. The child�s eyes lit up at the mention of tracking, which invariably led to hunting. Slipping his small hand into Snowdrop�s, he began tugging her deeper into the woods. **Thank you, beloved,** Kestrel lock-sent gratefully to Snowdrop. After the two were out of sight, Kestrel sank down to the ground, resting her forehead on her knees. She rarely regretted her decision to lifemate with Boar, but occasions such as this sometimes caused her to have second thoughts. The two were just of completely different minds. The glider started when she felt a hand on her shoulder and raised her head to see her friend Shyheart looking at her with concern. **It�s that lifemate of yours, isn�t it,**she sent, and Kestrel almost smiled at how quickly Shyheart had guessed what was going on. **It wasn�t so long ago that my Lightgaze was your boy�s age, and while he wasn�t nearly as�excitable as Tumble-** Kestrel had to smile at this statement; Lightgaze and her own rough-and-tumble cub had certainly been as different as the sun and the moon, **he tended not to dwell on things the way you�re doing right now. Trust me, after raising three cubs, I�ve learned that children have a funny way of forgiving and forgetting, and I�m sure Tumble will do the same.� Smiling warmly, Shyheart offered a hand to Kestrel to help her up, and the glider took it. She told herself that her friend�s advice was sound, but she just couldn�t bring herself to let go of the resentment and hurt that she was feeling deep within her. Another day passed, and it seemed that Shyheart�s statement had been true � Kestrel and Snowdrop had been keeping little Tumble busy, and he soon got over his disappointment. Kestrel herself had given him his first lesson with a real bow, and the boy seemed to have a natural talent with it. It appeared that he had forgotten his father's broken promise. 'If only I could say the same for myself,' Kestrel thought. This night, Snowdrop had offered to take Tumble out with her, as she could see that Kestrel � far from forgetting � was only getting more and more resentful with each passing moment. The glider sat near the entrance of the den, whittling a new flute to try and occupy her mind. She didn't know how much time had passed before she heard the sound of someone walking outside. Moving aside the hide, she glanced out and saw that, indeed, her lifemate had returned, his kill slung over his shoulder. Judging by his nonchalant facial expression, she could tell he had no idea that anything was amiss. Laying the spoils of his hunt outside the den, Boar bounded inside in his reckless manner. �Oh, I saw,� his lifemate replied nonchalantly, her hands subconsciously working quicker on the flute she was still carving. The glider saw her lifemate's eyebrow rise and knew he had perceived that something was off. Perceived, but nothing said. His quick sigh and hurried movements told her that he was irritated by her response. And yet, she sensed that he was not ready, yet, to get into another argument with her. Two could play that game. �What are you mad about?� he eventually snorted. He stopped moving around the room and faced her, crossing his arms over his chest defensively. "You really have no idea, do you?" Kestrel asked, looking up at Boar incredulously. "I asked, didn't I?" Boar responded. Kestrel set her flute down on the floor beside her and stood, meeting his eyes with her own. "Maybe it's the fact that you have no idea what's wrong that's the problem? Or, oh, I don't know, maybe the small fact that you forgot about your promise to our son?� She crossed her arms over her chest and raised an eyebrow at him. "What?" Boar asked angrily. His eyes flashed. He didn't like being accused of neglecting his son. A flash of fear and guilt in his eyes told her that he was slightly worried. "What promise?" �I don't want to hear this. You�re being unreasonable,� Boar snarled, turning and moving to fling aside the den hide. �So that's it then, you're just going to take off again?� Kestrel shouted at his back. �Far be it from me to disappoint you once again,� he muttered stonily, but ceasing his stride. �You still don't understand! It's not me you're disappointing, it's Tumble! You didn't have to come up with ways to distract him from the fact that his father was gone when he said he'd be back. And you missed out on giving him his first lesson with the bow.� With those words, Kestrel�s mask of anger slipped every so slightly, and regret began to show in her voice. Boar's comment hit home. Kestrel felt as though she had been hit in the chest, tears gathering at the corners of her eyes, but there was no chance that she would show throat now. �Maybe if he had his father around more often, his mother wouldn't feel so overprotective of him,� she snarled in a low voice, holding her stance in front of him. The two elves were so focused on staring each other down that neither realized Tumble and Snowdrop had returned. �Mother? Father?� he said in a small voice, his hand clinging to Snowdrop's. Both elves turned at his voice, and Kestrel could instantly see from his frightened expression that he had heard more of their fight than she would have ever wanted him to. �I'm here, son,� Boar said gruffly, kneeling down and holding out his arms. Tumble ran forward and buried himself in his father's arms. Kestrel watched ashamedly as Boar bent his head to nuzzle Tumble's hair. Snowdrop followed and placed a welcoming hand on his shoulder, glancing at Kestrel with a questioning look. Kestrel moaned inwardly, resting her forehead on the palm of her hand. Of course all her son cared about now was that his father was home. Tumble had stopped thinking about the broken promise, just as Shyheart had said he would. And he would have been happy to have his father teach him now that he was back. Still, Boar would take him out, play with him, and practice with him. �Let's give them some time together,� Snowdrop whispered in Kestrel's ear, and the two of them walked together into the woods. For what seemed like an eternity, neither elf ventured to say anything about what had just occurred. Kestrel thought about this silently. Her overwhelming love for her son had made her forget that important fact, and now she sorely regretted it. �It's hard to imagine that our little one acted more mature than I did. He really is growing up,� she said with a wistful smile. Snowdrop slung an arm around Kestrel's shoulder and gave a quick squeeze. �He's not there quite yet though,� she said reassuringly. Kestrel grinned gratefully. Some time later, the two returned to their den to find Boar and Tumble already lying together on the sleeping furs. Careful not to disturb him, Snowdrop snuggled in next to the sleeping Tumble, and Kestrel lay down quietly on the other side of her lifemate. She wasn't sure whether he was asleep or not, as he wasn't moving, but she knew she couldn't leave things the way they had been earlier. **I'm sorry, Ryn** she locksent, trying to convey her feelings of regret. Those feelings were eased slightly when he returned her apology, but she realized that it wasn't enough to repair everything that had gone on that night. Still, tomorrow would be a chance to begin anew.